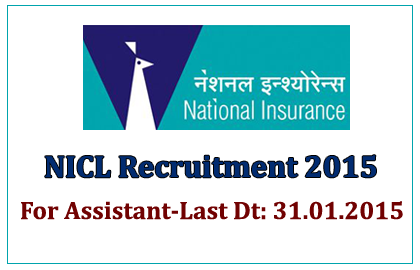 National Insurance Company ltd has announced openings for the post of Assistant Class-I Cadre. Eligible candidates can apply for this post before 31.01.2015. More details regarding this recruitment were mentioned below. Candidates can pay their fees through online from 12.01.2015 to 31.01.2015. Eligible candidates can apply for this post through online by clicking the link given below from 12.01.2015 to 31.01.2015.